My Golden Tote for May arrived and I was so excited to see what surprises I would receive. I was loving almost every surprise item I had seen other people post, so I knew this was going to be a great month! I also couldn't wait to try on the pieces I chose. I decided to try something new this month and actually model the clothes for you. Ok, so I hate hate hate getting my picture taken and always look awkward. Please forgive that. And now onto the box. Golden Tote changed their tote design for this month and I'm loving the simple design. I will definitely carry this bag (I carry all the previous totes also and I have lots)!!! So, when you order a tote of surprise clothing there is always a chance you won't like everything included. I generally do, so I continue to order. 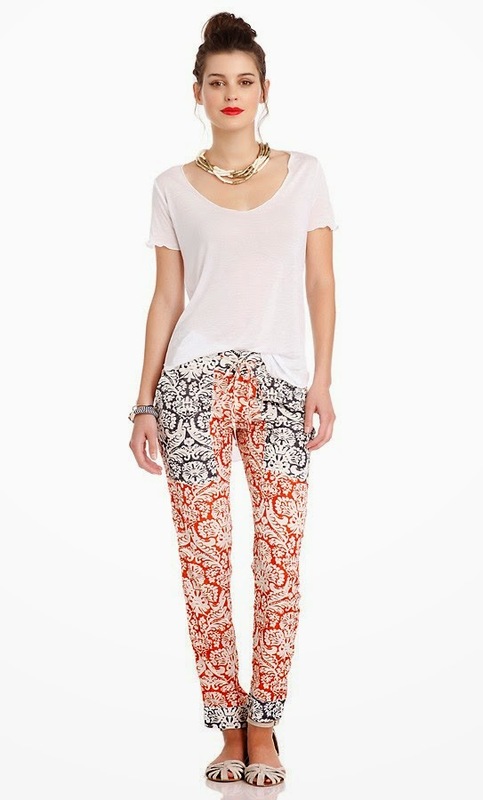 This month I really wanted the Slouchy Statement Pants, but they sold out in my size as I was checking out, so I decided to order the Paisley Pants instead. I loved the Striped Pants from last month (that also sold out too quick, so I missed out), so I thought I'd try the Paisley Pants. I was a bit unsure of the mostly red pattern, but I was going to try to be adventurous. When these arrived, I quickly tried them on and looked in the mirror and hated them on me. I do have one really bad mirror selfie of myself in these pants so I could try to trade them, but I do not feel comfortable posting it here. So, for these I will be posting the picture from Golden Tote. I ended up trading these, and I'm hoping the dress I traded them for suits me better. 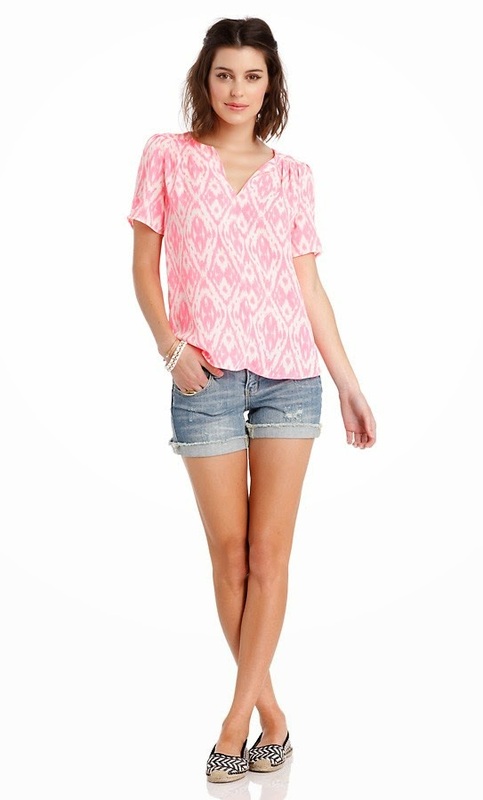 The other item I chose was the Pleated Printed Top in the pink ikat pattern. I didn't have any doubt that I would love this shirt. When it arrived it was a much brighter pink than pictured (like neon) and it washed me out and made me look even more pale than I already am (if that's possible). And it fit large, so I decided to trade this also. Again, I have a really bad mirror selfie picture of me in this shirt. So, instead I will post the picture from Golden Tote. So, this tote wasn't going too well for me at this point. I knew I had the option to return the entire tote and that was in my mind, but I wanted to see what else was included first. And I was hoping Golden Tote made better clothing choices for myself than I did! The first surprise item I tried on I was kind of meh about. It was an Under Skies speckled racer back tank with braided straps in navy. It was very sheer, so I knew I'd have to wear something under it. I tried to style this with different colored pants, skirts, shorts and it went with everything! I could wear it untucked or tucked in and it looked great. I was so happy with the versatility of this shirt! This was a definite keeper and I know I'll be wearing it with everything this summer. It's perfect because it works for the office or weekends. Here I styled it with some yellow jeans and strappy sandals. The next item I tried on I fell in love with! It was the Priddy by Puella shift dress in navy with pinstripes. This dress is so comfortable and will be great to throw on to go to the beach. Or for a casual lunch with friends. It's so soft and the Puella pieces always become my go to pieces! I wear them so often!!! I paired this with some slip on espadrille flats and a nautical inspired necklace. The next item was also by Priddy by Puella and was a swing tee. Again, I loved this immediately! I tried it on and thought I would never take it off. 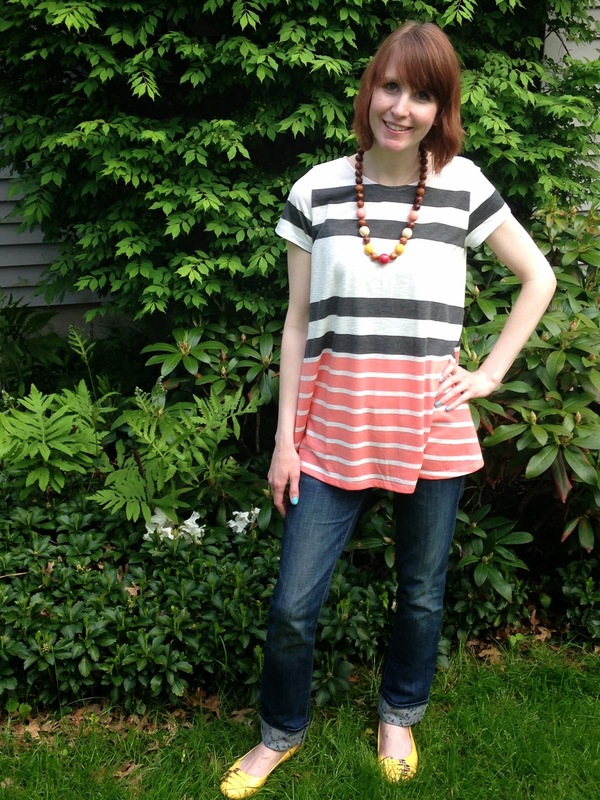 It's comfortable and casual and I love the coral and grey stripes! I styled it very simply with my favorite jeans that roll up to show a bird pattern underneath and some yellow flats and a beaded necklace. It's a cute, playful look! The final surprise item I was a little unsure of at first, but it is growing on me. It's a Naked Zebra pink tank dress. I love the details at the neckline and defined waist, but I wasn't too sure of the color on me, because I am so pale (and pretty much stay this color all year long, because I don't get tan). I saw others get a great teal color and I think I would have been so happy with that color. I'm trying to be adventurous and make this work on me! I paired it with the dark purple bralette from a past Golden Tote and some strappy metallic sandals and simple, sparkly jewelry. I actually like this look and want to wear this for a summer date night! I wasn't too sure about this Golden Tote, because the items I chose did not work for me. But I'm loving all my surprise items! I ended up trading the two items I chose this month and will report back with pictures if they work out. Did you order a tote in May?!? What was your favorite item? I love this styled reviews so much more ;) It's great to see everything on you. Totally get what you mean with the slouchy pants. I was thinking of ordering but was worried about how the overpowering pattern would look as a bottom :) The pink top is way too cute bummer it didn't work out. Thanks! I was so sad the pink top didn't work out. I was so excited about it, until I tried it on :( And yes, I definitely have Puella items I wear far too often, but I LOVE them!!! I think that pink dress is great on you! I haven't tried Golden Tote yet but I love the variety they seem to send each month. Great review! Thank you! 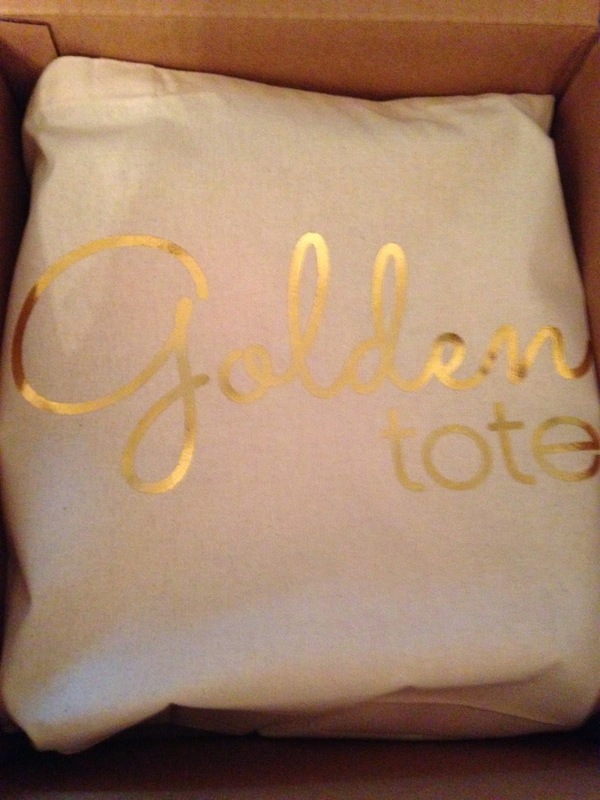 I have never been disappointed with Golden Tote. I always get pieces that I wear over and over. It's definitely worth trying! 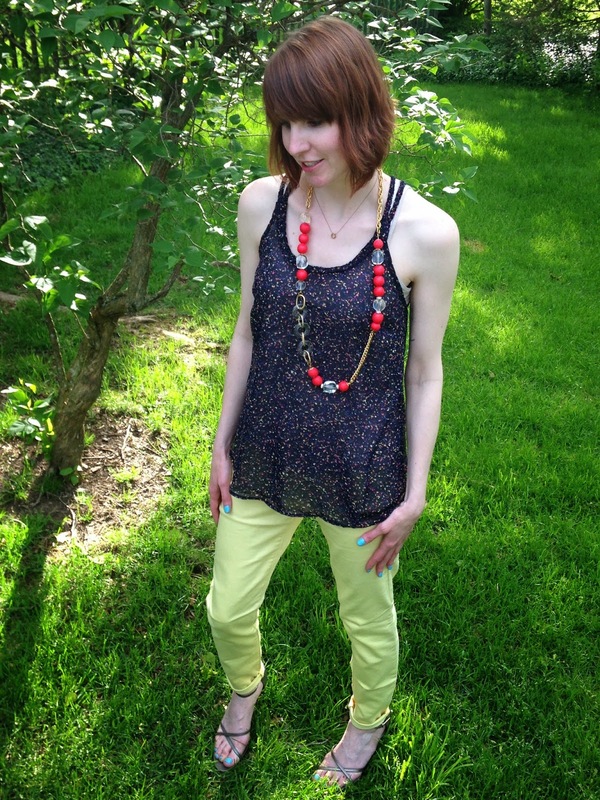 I got the speckled tank in the cream color--wish I had gotten the navy like you did. Bummer about the Pleated Printed Top--I traded for one from someone who also found it too bright, and I love it. Yeah, I was very happy I received the navy, because I'm far too pale to wear the cream color. I saw the pleated printed top you received on your blog and loved it on you! I wish it would have been a better fit for me, because I really did think it was beautiful. Did you buy a tote for June yet? What were your picks if you did?! ?